A part of a wing of an aircraft was discovered in July on the island of Reunion located in the Indian Ocean. Malaysian officials announced earlier this month that the wing was a part of the plane that disappeared over 500 days ago. Malaysia Airlines Flight MH370 took off from Kuala Lumpur, the capital of Malaysia, on March 8, 2014 just after midnight. It was supposed to be about a 6-hour flight to Beijing, the capital of China, with 239 people on board. The plane was a Boeing 777, a jet considered to be very safe. However, about an hour into MH370’s flight, the electronics on the plane that automatically transmit signals stopped sending them. The pilots on the plane stopped communicating. Nobody knows what had happened or where the plane went. A plane disappearing is an extremely rare event in today’s hi-tech world. Ships, planes, helicopters, satellites, and radars were all used to look for MH370. Over 25 countries were involved in the plane’s search, but the plane was not found. Experts are now on the lookout on the shores of Reunion Island for more debris that could be from MH370. Reunion Island is a part of France. It is approximately 9,000 km (5,500 miles) from Paris, the capital of France. 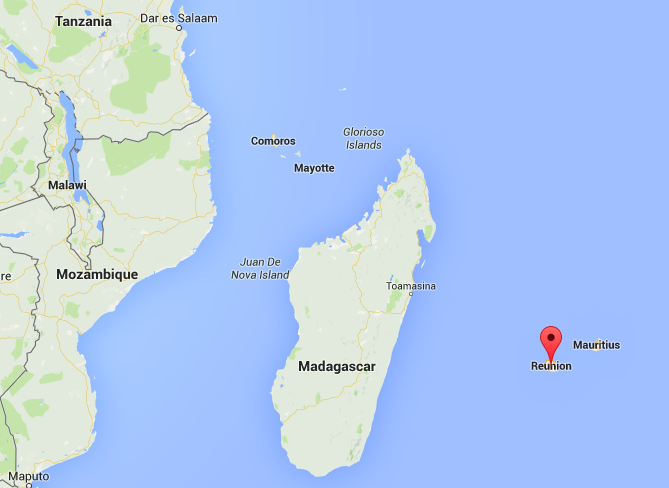 It is located between the islands of Madagascar and Mauritius. The island has forests, waterfalls, mountains, beaches, and an active volcano. France has other regions as well that are outside of Europe. For example, French Guiana is located in South America, but is a part of France.